The holidays are often a time when family and friends are able to come together. The Mighty Mighty Bosstones’ HomeTown ThrowDowns are no different. This show, a Christmas-time tradition for almost 20 years, has become a time of reunion for many. The Bosstones’ fans come from far and wide, around the US and many countries. Many of these people have met and organized fan clubs in order to stay in touch and meet up at concerts. There is the 737 fan club (named after the post-office box the band used to use to communicate with their fans) and the Buckminster Brigade (named after the Kenmore Square hotel where everyone stays). I even managed to bump into my new friend from the Netherlands again (mentioned in my review of Dicky’s Birthday Bash). The Bosstones’ fans are a dedicated group. I wouldn’t be surprised to see many of the people I met at this ThrowDown again at future shows, even those from England and Australia! Shortly after that, the guitarist from The Interrupters, one of the opening bands, came on to join in on a fantastic cover of The Clash single “Rudie Can’t Fail.” There were plenty of other surprises that night, including two fans invited onstage for a wedding proposal! I can’t even imagine what that soon-to-be-bride felt, first the surprise of being asked onstage and then for her boyfriend to get down on one knee! Of course, she said “Yes!” and everyone applauded. 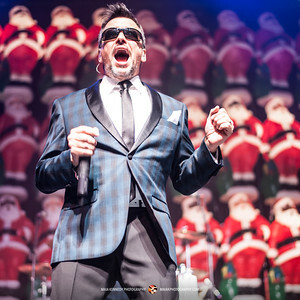 The Bosstones have a history of giving exposure to local bands and this year was no exception. There were three bands that opened this night: the punk band The Warning Shots, skapunk band The Interrupters, and an acoustic song by Lenny Lashley’s Gang of One. These were all great bands that I would go see again anytime. This HomeTown ThrowDown not only provided a ton of great music and a wall of santas, but also a chance to help others. The Bosstones offered a limited number of VIP passes to the House of Blues Foundation Room where people could meet members of the band before the show. The money from this fundraiser went to Veterans Inc, an organization dedicated to helping veterans and their families. There was also another chance for everyone to help just as they were walking into the show; Love, Hope, Strength had a table there where people could register to be bone marrow donors. This organization’s motto is “Saving Lives, One Concert at a Time” and they have added thousands of people to the national marrow database in the process. Showing his love again for the opening band, The Interrupters, Dicky changed into one of their shirts for the encore songs. And perhaps as a shout-out to the 737 crew in the audience, “Seven Thirty Seven/Shoe Glue” was the final song of the night. t's good to know somebody's there. Taking the time to say hello. Taking the time to show you care. Write again and thanks again from the bottom of my heart. 17. Sunday Afternoons on Wisdom Ave. If you're interested in purchasing any of these photos, click here.